Being green is getting harder and more expensive, with China now saying they don't want as much waste from the U.S.
Lowell has gone from paying nothing to have its recycling hauled away to shelling out roughly a half a million dollar cost a year. China used to buy the majority of the United States’ recycling. Now, however, they have cut back on the amount they will accept. Most of the state’s nine landfills are already nearing their permitted capacity. Stringent new standards on the recyclable items Chinese processors will accept has rippled into local cities and towns, costing some hundreds of thousands of dollars and potentially crowding out other critical municipal services. Lowell, for one, has gone from paying nothing to have its recycling hauled away to shelling out as much as $75 a ton, which adds up to roughly a half a million dollar cost a year. China used to buy the majority of the United States’ recycling. Now, however, they have cut back on the amount they will accept, what they will take has to be cleaner than ever. Sorting Your Garbage: Recycling or Trash? Lowell's Recycling Coordinator Gunther Wellenstein shows you what belongs in your recycle bin, and what needs to be put in the trash. Back home, that means it’s more expensive for the processors that took recyclables. And they are passing the cost to cities and towns. “It’s definitely a crisis,” Wellenstein said. For example, you might think a paper half-gallon milk carton could be recycled. But not in Massachusetts. It’s too expensive. In fact, in many cases throwing things in the trash is now cheaper than recycling, as service trash haulers until recently were offered for free or at low cost. That motivated cities and towns to encourage people to recycle, in order to reduce costlier trash. The pain is from a one, two punch that has blindsided the industry. The first hit: China’s decision to no longer accepting “dirty” or contaminated recycling, like plastic bags, straws, clothes, or items mixed with food. In Lowell, for instance, almost a third of what people try to recycle is contaminated. But China only accepts it if contamination is half a percent or less. Renter Beware: Who Are Boston’s Worst Landlords? So the city of Lowell wants homeowners to put a lot more thought into what goes into the recycling bin. And on their side of it, the city has hired trash pickers of sorts to catch problem items before they make it to the processing plant. “Every day, grid of the city, we check every single bin,” said Brian Whitts, who works at recycling enforcement for the Lowell Department of Public Works. Processors have had to hire too. Waste Management, which hauls both trash and recycling, processes 450 tons of recycling just at its Billerica plant each day. They are now spending more money on equipment and workers to pluck out banned items, and they find some whoppers. “We see an amazing amount of bowling balls,” said Chris Lucarelle, the recycling director at Waste Management. He said they find that about 14 percent, which averages 63 tons a day, of items set out for recycling is no good and has to be thrown out as trash. And most of the state’s nine landfills are already nearing their permitted capacity. To make more room, the state has been forced to allow some landfills to temporarily expand. But three of them are expected to close completely within the next 18 months. Under one scenario the state could be left with just two—in Bourne and Westminster—by 2021. And the second blow from that one-two punch? Glass. Bottlers used to take it from cities and towns for free because they could reuse it, but the last bottler in Massachusetts shut down earlier this year. Communities now pay upwards of $80 a ton to have someone like Chris Carney, owner of Carney Environmental, take it and turn it into construction fill. 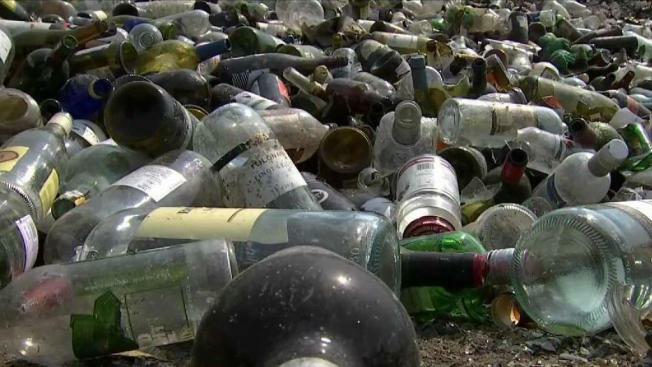 If the bottles weren’t being crushed, “They’d go right to a landfill,” Carney said. So now, take the extra trash going to landfills, and add glass. The competition has processors hauling our waste to more land-rich states. “There aren’t enough trucks, there aren’t enough drivers,” Carney said. That leaves cities and towns taking a big hit. The state just rolled out $2.6 million in recycling grants hoping to help spur innovation and ease the burden for communities. But everyone the NBC10 Boston Investigators talked to said we have to think more big-picture, from manufacturers down to consumers, on ways to use less.